One of the things I love most about making videos on YouTube is connecting with all of the other amazing creatives out there. Every once in a while, one of these incredibly creative people will come up with a challenge and invite us all to join in. After watching the $5 Goodwill Challenge hosted by Hilary of My So-Called home for years, I have finally had the time to participate! I joined in for the fall 2017 edition of this challenge - which basically asks you to find an item for $5 or less at Goodwill or a thrift shop, and turn it into a fall decor piece. I had no idea what to expect when I went to my local Goodwill, but I found something that I just knew I could transform into a beautiful decor piece. Start with a colander, this is a great use for an old colander that you no longer use, or something that you thrift or find at the dollar store. I found this colander for just $4 in the homeware section of Goodwill. I didn't love the color but I had an idea in mind. Using some spray paint (I chose copper but you can use any color you want) paint 2 coats on the colander, letting it dry for a few minutes in between coats. Once the paint has dried, it's time to add some flowers. I always pick up extra faux flowers whenever I see them on sale at Michael's. I had a bundle of non traditional fall flowers that I thought would complement the copper color nicely. Start adding and arranging the flowers however you like. I cut the wire stems down from the original length and then bent them to get the desired height for each flower. 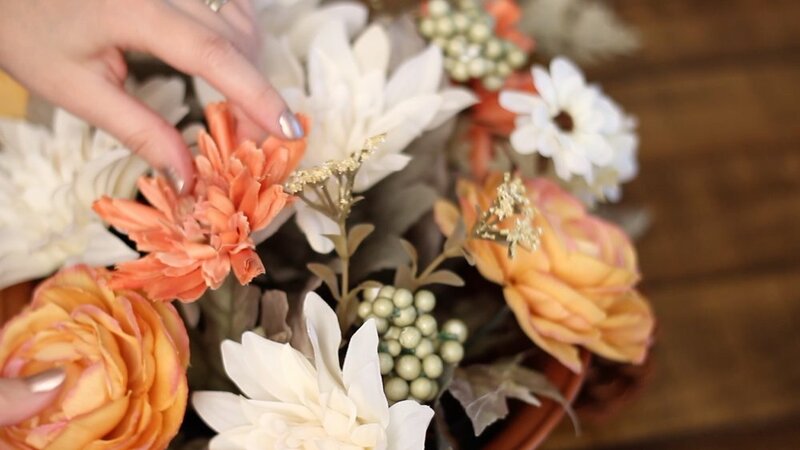 Add extra embellishments such as pine cones or small gourds to make it even more festive for fall. I also added a string of fairy lights, which I wove throughout the flowers. I just love the slight glow that the lights give off once they are turned on. That's it! This transformation couldn't have been more simple, but this decor piece looks nothing like what I started with. I had so much fun with this challenge and I encourage you to head to your local thrift store with $5 and a creative mind and see what you can find! As always, you can also watch a full video tutorial below. Happy Fall!